Location: 405 Mulberry St., Memphis, Tenn. The world lost one of its greatest minds and hearts when Dr. Martin Luther King, Jr. was assassinated by James Earl Ray at Memphis' Lorraine Motel on April 4, 1968. 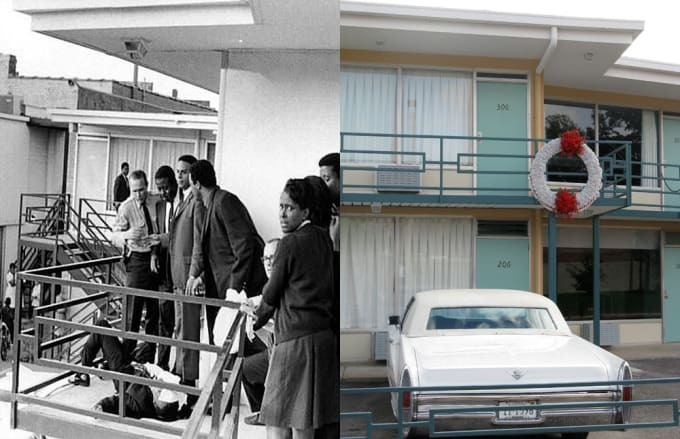 Just one day after delivering his "I've Been to the Mountaintop" speech, Dr. King booked room 306, a room he and Ralph Abernathy stayed in so often that it was known as the "King-Abernathy suite." Dr. King was struck with a bullet as he stood on the second floor balcony, and Jesse Jackson—who was nearby—says his last words were, "Ben, make sure you play 'Take My Hand, Precious Lord' in the meeting tonight. Play it real pretty," spoken to musician Ben Branch. He was pronounced dead at St. Joseph's Hospital, and an autopsy revealed that though only 39 at the time of his death (the same age as Malcolm X at the time of his death), he had the heart of man in his 60s, most likely due to the stress of the burden he carried as the figurehead of the Civil Rights Movement. Big K.R.I.T., on his song "2000 & Beyond," was correct in his assessment: Can you imagine what this man saw when he went to sleep at night? Today, the Lorraine Motel serves as the National Civil Rights Museum. It was dedicated on the Fourth of July in 1991, and officially opened to the public at the end of that September. Owner Walter Bailey left rooms 306 and 307 unoccupied following King's murder as a tribute to him, and the wreath you see is where King stood on the balcony.